When we told you about Cherene Slue on Friday—the woman who allegedly robbed a Loop Subway sandwich shop while wearing her Jimmy John’s uniform—we mentioned that detectives were trying to determine if she was responsible for any similar robberies of downtown fast food joints. It took two days for detectives to determine the answer to that: Yes, she (allegedly) is. Cops went to Slue’s home in the 1600 block of North Monitor on Sunday afternoon and arrested her again. This time for allegedly robbing the Dunkin’ Donuts at 1231 South Wabash. Around 11 p.m. on January 12, Slue walked into the donut shop, stated that she had a gun, and demanded that the clerk hand over $40, according to prosecutors. The worker handed over exactly $40 and Slue reportedly left satisfied. Slue has now been charged with aggravated robbery-indicating the presence of a firearm in the donut shop heist. In an appearance before Judge Stephanie Miller, Slue was ordered held without bail. That’s quite an upgrade from the electronic monitoring and signature bond that Miller gave her for the Subway robbery. 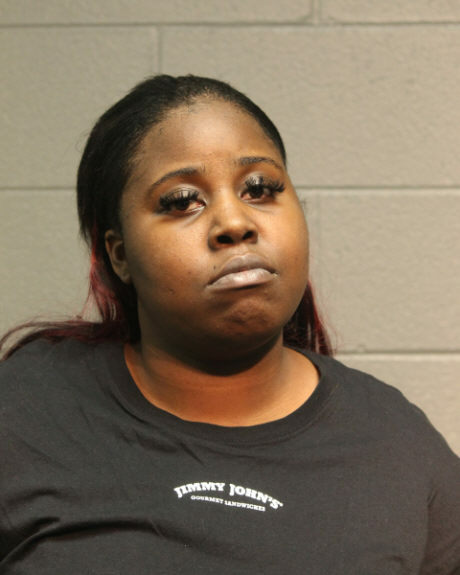 The Subway case unfolded around 8 p.m. on January 15 when Slue allegedly walked into the sandwich shop at 604 South Wabash and handed the clerk a note demanding $60. She left empty-handed when the worker walked to the back of the store, police said.